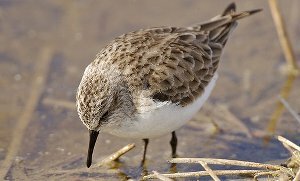 In winter the Little Stint has dull grey upperparts and white underside. It's bill and legs are black. 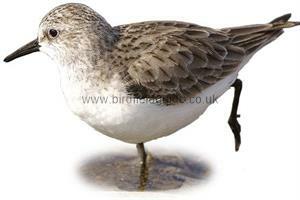 It is one of the smallest waders, smaller than a house sparrow. 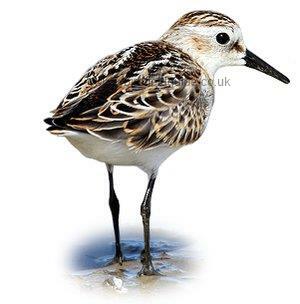 The first identification clue for the Little Stint is it's very small size, it moves in very quick jerky feeding actions and runs not unlike a Sanderling. Note the strongly patterned summer plumage of this Little Stint. The back feathers are black centered and edged chestnut, also note the wing tips protruding beyond the tail. The eye stripe is not very defined on this bird, but is still present. The Little Stint has a greyish-brown back, note the dark centre to the feathers, a distinctive feature of the Little Stint in winter. A rare breeding bird in Northern Europe with most nesting further North and moving South in the autumn to winter. A rare passage visitor to the UK where around 700 individuals are recorded per year. 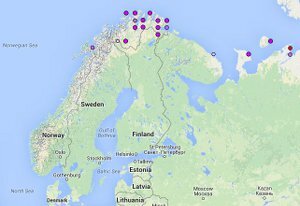 Breeds on high arctic tundra. On passage is usually seen near muddy freshwater pools. Little Stint in winter plumage feeding. 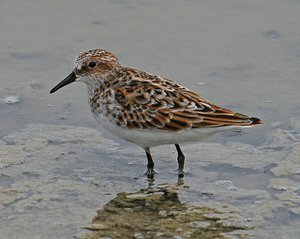 In summer the Little Stint is bright and strongly patterned. Plumage can vary between birds with breast and head varying from orange-rufous to chestnut. The back feathers are black centered and fringed cream and chestnut.